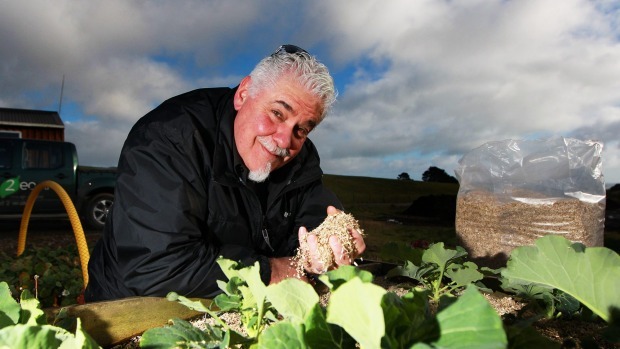 Taranaki man Greg Flavall spreads hemp as mulch between broccoli plants and pats it down like a man caressing a cat. 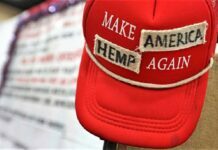 Hemp is his pet, his passion, his life. Now, let’s get things clear from the start. “It’s a cousin to marijuana,” he says. But in its ability to get people high, it’s a second cousin far removed. Cannabis contains high levels of mind-altering tetrahydrocannabinol (THC), while hemp contains the tiniest trace of this chemical. 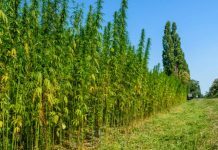 Still, to grow hemp in New Zealand, you need to have a licence from the Ministry of Health at a cost of $511 and prior to harvesting your crop needs to be tested for THC. The reading needs to be below 0.3 per cent to pass the test. “Our harvests to date have been below 0.002 per cent of THC,” Greg says. “It’s not psycho-active,” he says, explaining what it would take to get high on hemp. But this renewable crop’s uses are many and varied. Today, we start by looking at bales of blonde-coloured hemp, which is cellulose, the inner woody core of the plant. Greg is spreading it on a raised bed at the Colson Rd dump where Russell How from Return 2 Earth operates. Behind the gardens are small hills of compost at different stages in the life cycle. The two environmental entrepreneurs, both originally from Stratford, are working together on a number of hemp projects – some top secret, some OK to talk about. Using hemp as mulch is on the tick list. “It’s aerobic, it’s insulating, it provides nutrients for the soil, it retains moisture,” Greg says. He dumped the hemp into the hole and within minutes there was no smell. “All the ladies, seven or eight of them, all used it and were quite happy, so I was pretty chuffed that day. Russell envisages DOC workers all over the country tramping to huts carrying a light bale of hemp to sort out long drops. But the woody hemp offers way more than mulch and a long-drop deodoriser. It can be used as animal bedding and to build houses. Working with Venture Taranaki, Lincoln University did a study last year looking at agricultural alternatives for the region. “They came up with hemp and honey for Taranaki – and we have both,” Greg says. Hemp is a renewable crop. This quick-growing plant develops leaves every 30cm, creating its own ground cover. When its leaves drop all the nitrogen and carbon is returned to the soil. It takes 125 to 130 days to grow a mature crop. “In one hectare there’s enough material to build an average-sized home,” he says. Once harvested, the hemp goes into a hammer mill, which is a big industrial rotary beater. It separates the fibre, which is the bark of the plant, from the inner woody core. 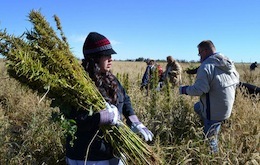 The seeds are also harvested and used to make hempseed oil. The by-product of this is seed cake. New Zealand’s first hemp house is in Bell Block. The home is about five weeks away from a certificate of compliance and the second house is being built on South Rd at Blagdon. Greg, who has been a builder in California for 25 year years, off and on, was remodelling a bathroom for friends when he first learnt of the leafy plant. The woman of the house, Chris, was studying law and doing a thesis on “hemp, the miracle plant of the future”. “I said ‘hemp, what the heck is that?’ Next thing you know I’m in England learning how to build with it. So we started Hemp Technologies in North Carolina,” he says in an American accent with hints of Kiwi vowels. He thinks New Zealand is behind the times in regards to the hemp industry, especially in regards to housing. It’s also good for the land. This year he is concentrating on trials with Massey University to look at the use of hemp crops for heavy metal extraction from degraded or toxic soils. Russell says hemp played a major part in the clean-up of Chernobyl and it’s ongoing. One woman even drives from Whanganui to get the soap. Hempseed oil also has the right balance of omegas 3, 6 and 9, plus 17 amino acids. It has the essential fatty acids of flaxseed oil and the gamma-linolenic acid of evening primrose. “It’s very good for skin and nails as well as supporting the immune system,” Greg says. Under the Australia New Zealand Food Standards Code the oil can be sold for human consumption, however the seed cake and derivatives must be labelled for animal use. “When we cold-press the seed for oil, the by-product is seed cake, which we then further mill for proteins and flours. A woman in Ashburton who has been feeding seed cake to her milking goats says her feta is the best ever. 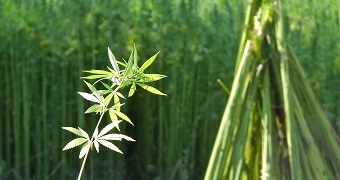 Further afield, hemp is used as a break crop in Canada. After growing hemp, grain crops produce higher yields, Greg says. 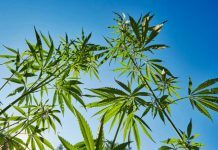 Together with a partner company in Australia, there has been up to an 80 per cent boost in maize production following a hemp crop. Both men say a hemp house is non-toxic and provides an alkaline environment, which is healthier for humans. Greg says that in every way growing hemp makes sense. And he’s off again, like an evangelist, preaching the miracles of hemp.